There’s nothing like the sight of a sleeping baby. I’m constantly on the lookout for natural objects that can be used as beds for my dolls. A baby can curl up in a cradle made from half a walnut-shell. This walnut is bigger than most that you can buy in a bag at the super market. I usually pick out the larger ones during Thanksgiving season, when the stores sell them in loose bins. I am a curious sight, digging through the box, determined to find the biggest ones. To make the nuts more easy to split open, bake them in a low oven at about 200 degrees for a few hours. They start to crack along the center seam and you can then break them open with a knife. You can also cut the shells open with a fine saw. In the above illustration from my up-coming book, Pocketful of Posies (Sept. 2010), I sawed half a walnut-shell in half again lengthwise, so that the side could be seen in relief. 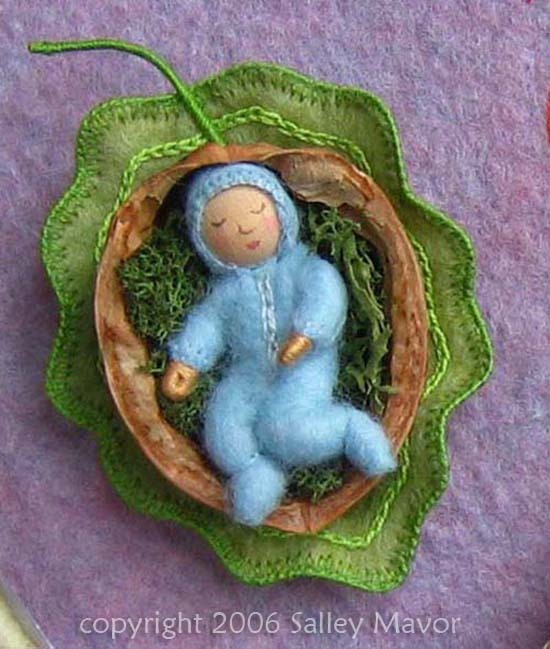 This blue suited baby is lying on real reindeer moss in a walnut-shell. He is part of an illustration from my board book, Wee Willie Winkie, on the page that says, “Are the children in their beds?” This image is available as a note card in my Etsy Shop. I edged the felt leaf with wire to give it a curvy, raised lip that fits the shape of the walnut. You can glue the shell in place or drill holes and sew it like a button. 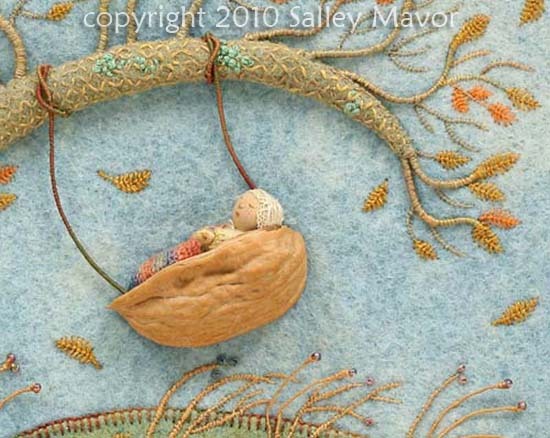 This entry was posted in Dolls, Fabric Relief, Found Objects, illustration, Nature, Wee Folk by Salley Mavor. Bookmark the permalink. Good fun. Your blog has me thinking. i found your beautiful things you do. Thank you for a peek inside your head on how you think when you are creating. The idea of the wire to shape the leaf is so clever! always love a sleeping baby! Oh gosh I’ve just found the kingdom of the fairies! I really enjoy your new blog. May I add you to my blog roll? How delightful to have stumbled across your wonderful blog! I’ve been a fan of your work for ages and I’m really looking forward to seeing more! 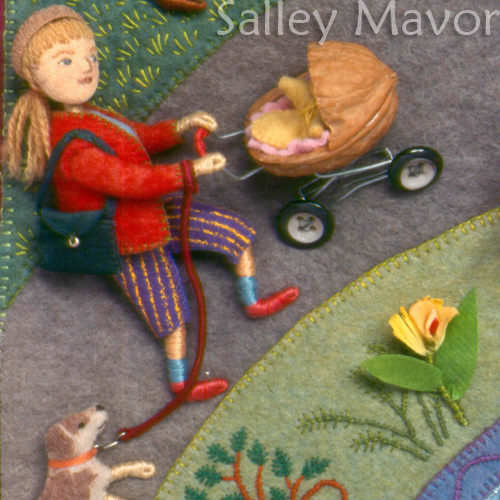 Sally, You are a most amazing miniature artist ! I’d like to ask your permission to paraphrase your comments on both my blogs, link to yours of course and if you allow me to post a couple of your photos as well. Alexandra, thank you so much, and please do go ahead and paraphrase me and post some of my photos. Ah, so THAT’s how you find walnut shells big enough for bairns! Also, what about horse-chestnut balls? Do you suppose such a thing could be dried carefully and made into a cradle for a wee Wild Child with spiky hair? Some great ideas! Ive got a post on milkweed pods ready to publish in the near future. Oh! Your work is so delightful and intricate! I’m in awe! I added you on to my blog roll and hope that some of my readers hop on over here! 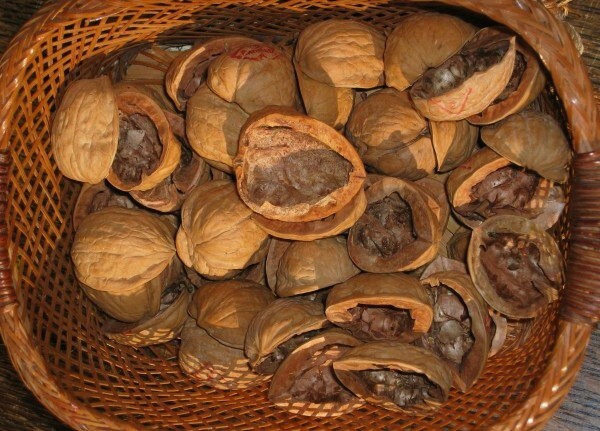 Where do you get your walnut shell halves from? Or do you crack them all yourself?